When we had to come up with our most anticipated read for 2013, it was not a hardship for me. As far back as July last year I knew that my most anticipated book for this year was going to be The Firebird by Susanna Kearsley. I was so excited to get an advance copy, and loved reading the book too. This week I have discussed the book with one of the bloggers who inspired me to start my blogging journey. Rosario has the first part of the discussion and I have the final part at my blog. If you need a really brief summary....we both loved it! Now to wait for the next Susanna Kearsley book to come out! 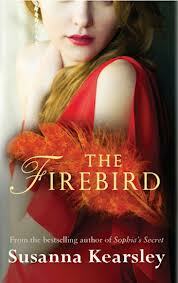 I'm reading The Firebird right now and am really enjoying it. The Shadowy Horses and Mariana remain my favourite of Kearsley's novels though, and I don't (at least at this point) see this one changing that. My favourites are The Shadowy Horses, The Winter Sea and The Rose Garden, followed by this one and then Mariana. I have read The Rose Garden and Mariana so far. Mariana is my favorite so far, but they were both great. I am really looking forward to this new one.